40 THE SHOP JANUARY 2019 Prewar Resto p.40 Tired Iron Profile p.46 PCVs p.50 JANUARY 2019 ANDY'S GARAGE www.wiseandysgarage.com Andy Wise of Ellendale, Delaware, was a certified Ford mechanic for 35 years. He restored a 1953 Chevy truck while he was still in high school and the journey began. Today he owns an award-winning 1926 Pontiac and a 1917 Oakland. His business, Andy's Garage, provides several specialty services to restorers. Wise relines the cone clutches used in early cars with soft Kevlar. He also does shock absorber strapping and re-straps Gabriel Snubber shocks. Another service is relining mechanical brakes. Prewar 40 THE SHOP JANUARY 2019 Someone, somewhere, has what you need. 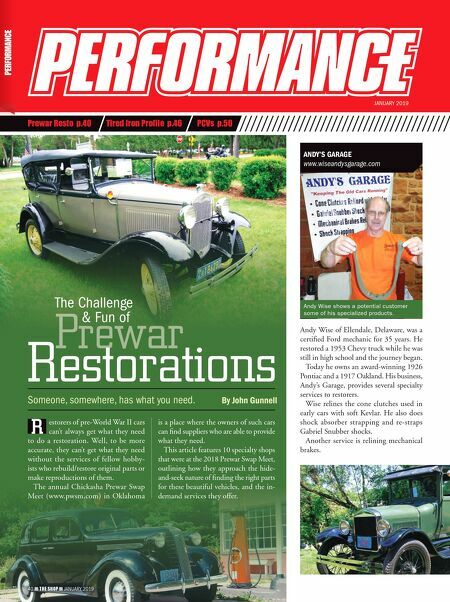 By John Gunnell Restorations The Challenge & Fun of R estorers of pre-World War II cars can't always get what they need to do a restoration. Well, to be more accurate, they can't get what they need without the services of fellow hobby- ists who rebuild/restore original parts or make reproductions of them. The annual Chickasha Prewar Swap Meet (www.pwsm.com) in Oklahoma is a place where the owners of such cars can find suppliers who are able to provide what they need. This article features 10 specialty shops that were at the 2018 Prewar Swap Meet, outlining how they approach the hide- and-seek nature of finding the right parts for these beautiful vehicles, and the in- demand services they offer. 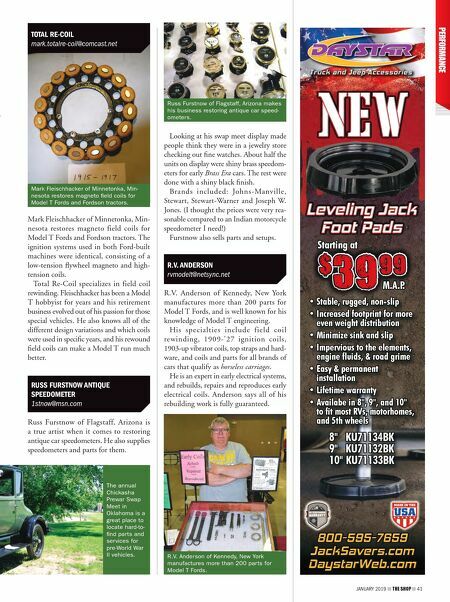 40 THE SHOP JANUARY 2019 Andy Wise shows a potential customer some of his specialized products.